One way to order is to visit one of our retailers, otherwise we can process your order for you and answer questions by phone or email. 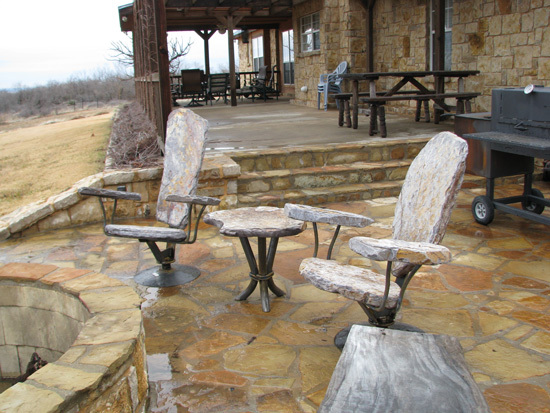 Since stone furniture is custom made, we like to speak directly with you before building your custom stone furniture. Orders are processed as received and typically take anywhere from 3 to 8 weeks to complete. How do you ship stone furniture? We send out deliveries by freight. Your furniture will come to you fully assembled on a pallet, just take off the boards using a crowbar and hammer, then move the furniture into place. There is never any over-packaging. All you need to move it is a dolly, or 2 people can set it up together. Smaller orders are sent FedEx Ground and do not require a signature or appointment with the delivery person. Do you ever deliver and setup? Yes all the time! Our base is located just outside of Fort Collins so many times we will deliver and setup furniture providing you live within Denver or the surrounding areas. We include a small fuel surcharge, but you get to meet the artist and have his professional opinion on placement of your furniture. We have several retail stores where you can go to purchase Stone 2 Furniture products, please visit our retail page to see our locations. Currently we are in the process of securing more locations. Our shop is located 30 miles northwest of Ft. Collins, Colorado. Clients are welcome to visit, be sure to call to schedule an appointment so we don’t miss you. How much does stone furniture weigh? A large Deep Seating chair weighs around 180 lbs -200 lbs. Tables weigh around 80 – 120 lbs. Here is a video of how Stone 2 Furniture products are shipped. When your furniture arrives at your home or business, don’t worry you do not need a forklift to unload it. The trucks are equipped with a lift gate that gets your furniture down to the ground. From there you take the boards off and can use a dolly to get it into place. The other option is to buy some beer and pizza and invite your friends over to help you move it. Or Labor Ready is also another option, a couple guys can move the chairs together. 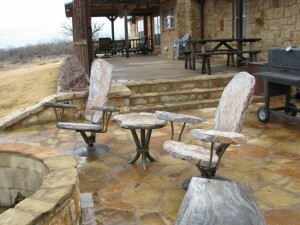 I know that you are going to be amazed with the quality of your stone furniture and amazed at the comfort. That’s why I’m giving you 30 days to test your Stone Furniture. And if you are not 100% satisfied I’ll refund your money and pay the guys in blue to ship it back to me (and you know they don’t work cheap!). On top of it all, I will refund YOUR original shipping cost! You have nothing to lose with our ROCK SOLID Guarantee! Call today to personally place your order with me.